Morning news bulletins on Russian TV channels have been full of triumphant coverage of Vladimir Putin's outright victory in the first round of the presidential election. Most national newspapers have welcomed Mr Putin's win, with one describing it as the moment of truth. However, Russian bloggers are expressing disappointment, talking of humiliation and the theft of the vote. The three leading TV channels - state-controlled Channel One, official state television channel Rossiya 1 and Gazprom-owned NTV - have been providing the latest updates on voting results as well as reactions from the other four candidates. Their coverage of alleged election violations - which monitors as well as Mr Putin's rivals and opposition activists say have taken place - has been limited. The channels covered a late-night pro-Putin rally in Moscow as well as his appearance at his campaign headquarters, where he thanked supporters and recited some poetry. The daily Rossiyskaya Gazeta carries a half-page picture of Mr Putin and outgoing President Dmitry Medvedev, with satisfied expressions on their faces, at the late-night rally in Manezhnaya square in Moscow. The headline reads: "Moment of Truth: the first results of the presidential election clearly answer the question of whom the majority of Russians have voted for. The majority are for Putin". Popular pro-Putin tabloids Komsomolskaya Pravda and Tvoy Den have pictures of a smiling Putin on their front pages. 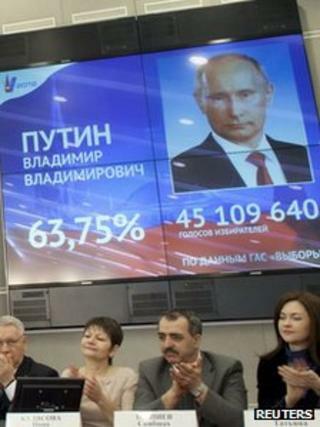 Tvoy Den's headline reads: "Victory Day: Putin wins in the first round of the Russian presidential election". Liberal daily Novyye Izvestiya stresses the role recent protests played in the election: "Choice made: irrespective of the final results of the race, victory belongs to both, Vladimir Putin and civil society". The liberal Novaya Gazeta runs the headline: "Game over: you can lead in an election but you cannot mislead a nation". Another popular media personality, League of Voters co-founder and election observer Tatyana Lazareva, says on the League's website: "I understood before that this election was completely illegitimate, but I am now convinced of this once and for all." TV producer Vera Krichevskaya, who was one of the co-founders of the independent internet and satellite broadcaster Dozhd, says: "The picture in the centre of Moscow… is not of celebration, it is the forceful seizure of the territory of the square - we are having our votes, our squares, our taxes stolen from us." BBC Monitoringselects and translates news from radio, television, press, news agencies and the internet from 150 countries in more than 70 languages. It is based in Caversham, UK, and has several bureaux abroad.